Indoor use stool. 100,000 Heavy duty Commercial Vinyl. White, Black, Charcoal, Taupe, Red, Blue, Tan, Orange and Green. 25mm square x 1.5 guage 304 polished Stainless Steel. 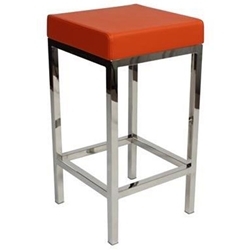 Available with a back also and Known as the Lima Stool.